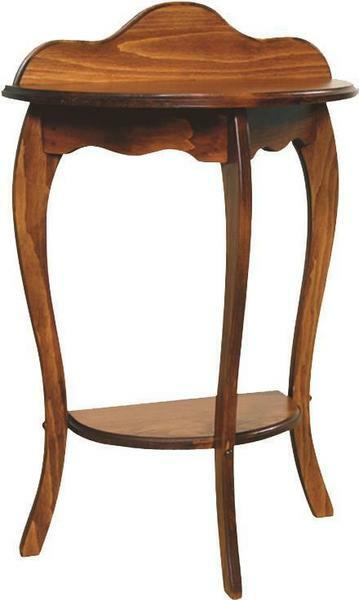 The Amish Pine French Country End Table loves to dress things up a bit! The curvy top, apron and legs combine to reveal what french country style loves, wearing fancy with simple for a big impact. This End table is perfect for holding small items in the living room or den and features a lower shelf you can also use. This end table is made with solid pine wood that's softer than other hardwoods, but will perform beautifully. There's a more rustic look to pine wood that wears natural knots and variations. Pine is a great candidate for a painted finish or for distressing that shows off an antique look. This pine end table is crafted by the Amish in Pennsylvania and ships free within the US. You can order samples to choose from, simply select them online or feel free to contact a Furniture Specialist by email or phone. Thank you for shopping pine furniture at DutchCrafters.